I had a facial once by a very sweet and talented esthetician with the WORST breath imaginable. Every time she exhaled while directly above me, I cringed - I wanted out of that facial so badly I couldn't think about anything else! I wanted to say something, but I just stopped booking her rather than put myself in an awkward position. A friend of mine told me about a similar experience she had with a nail tech who did her gel nails. She said, "She gave the best permanent french manicure in New York, but her chronic halitosis was too much to bare, so I started seeing another girl in a different salon." OUCH! So breath is a touchy but important issue in client retention. In almost all services, client s are sitting under you, across from you or directly in front of you, it is very important to make sure your breath not offensive. What you eat for lunch stays on your breath for hours, not to mention that sinus, digestive and gum issues can also cause foul smelly breath. Chewing gum while performing services isn't attractive or professional, and it is also ineffective for strong foods like garlic, onion and spices that can linger heavily for hours. And these spices are in almost everything - even some salad dressings cause stank breath! The best solution for this problem is Mint Asure Mini Capsules. They are 100% natural and work from the inside out. After eating, enjoy 2 or 3 MintAsure mini capsules in your mouth for a few seconds, then swallow with beverage of choice. The powerful mint coating on the capsules instantly freshens breath, but the real magic happens once you swallow these babies! 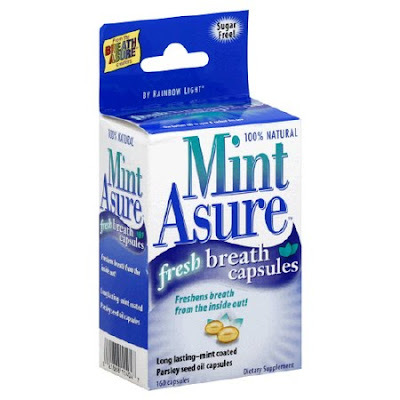 Mint Asure capsules release odor fighting Parley Seed and Xylitol for fighting strong breath odors caused by garlic, onions, peppers and spicy foods. They REALLY, REALLY work and they are VERY easy to swallow. I have them on me at ALL times. Try them, and don't be afraid to get close!